Woven Construct is a seat, a screen, a space. It is made out of 105 pieces of douglas fir, 182 pine dowels and 14 steel shoes. The structure is informed by its place; situated outside Munkeruphus on Gunnar Aagaard Andersen’s patio, overlooking the Kattegat sea. The screen is orientated on a Northeast–Southwest axis, sitting with its back to the sun catching the evening light and framing garden views. The vertical members touch the ground delicately, bridging between the paved stone patio and sloped terrain. The weave reveals itself at the open ends. At just over two meters high, the screen is scaled to the individual. 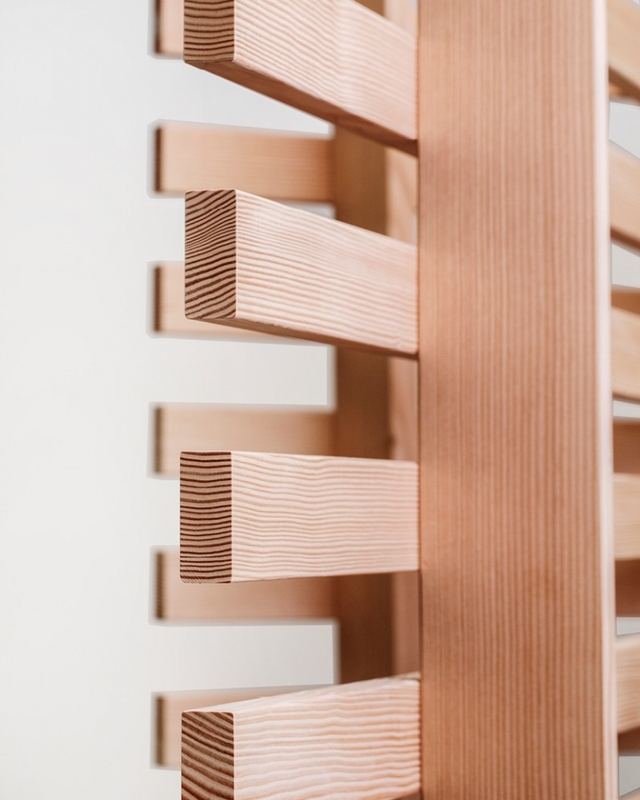 Where the body touches the structure the horizontal members rotate to create a bench and provide a backrest. Subtle adjustments to the placing of elements set up the rhythm and scale of the screen, allowing moments of transparency and privacy, a two way screen filtering light, sheltering from the wind, inviting the visitor to pause. For us to reform is… To create a dialogue between people, place and material, through the act of making. Architects Anne Dorthe (DK), James (IR) and Eibhlín (IR) all studied at the Aarhus School of Architecture. This is their first collaboration together. Since graduating in 2011/2012 they have each embarked on their own individual careers. Anne Dorthe’s focus is on furniture design and small-scale architectural structures. James has spent his time between Tokyo, Berlin and Basel working on solo exhibitions and collaborating with international ateliers. Eibhlín currently lives and works in Dublin. Having spent two years in Switzerland working in Atelier Peter Zumthor she moved to upstate New York to collaborate with Arts Letters & Numbers.